Another giant of the sf community has fallen: author Harlan Ellison has died at the age of 84. My first exposure to Ellison's work was something that never failed to provoke a blast of venom from him in later years: the 1973 Canadian TV show The Starlost. The series was about a huge starship carrying the last survivors of Earth in a collection of domes, each habitat having devolved into dangerous societies of the past because the passengers have been adrift for so long that they've forgotten their origins. A trio of plucky young inhabitants (led by 2001's Kier Dullea) discovers the truth about their existence — and the fact that the ship is headed for destruction if they can't figure out how to change its course, and get all of the other passengers on-side. Adventure ensues. It was a complete and utter piece of crap. Even as a kid, I could see that, and even though it was re-run a couple of times over the years, I never watched more than a couple of episodes. Interviews in later years would send Ellison into a froth over his experiences with the studio and network, and his opinion of the Canadian TV industry in general. A bit harsh, considering his complaints about dealing with the American TV industry. In any case, it probably wasn't the best way to be introduced to the creative mind of Ellison, but I was a kid when I saw the reruns in the late 70s, and the only people associated with it that stuck out to me were Dullea and Walter Koenig (though looking at the cast credits on IMDB, I notice that John Colicos of the original Battlestar Galactica and Star Trek: Deep Space Nine, and Nerene Virgin of Today's Special both appeared in episodes) — I didn't know who Ellison was at that point. Fast-forward to my teenage years, when I started encountering his stories in various anthologies, starting with "Soldier" in Asimov and Martin H Greenberg's Isaac Asimov Presents The Great SF Stories: 19 (1957). It wasn't a short story that particularly stood out for me, although, rereading it yesterday, I can see how I would have been struck by its unflinchingly brutal portrayal of war. Other stories would follow, and ones like "I Have No Mouth, and I Must Scream" did tear their way into my memory and leave permanent scars. Round about that time, I was also watching reruns of The Outer Limits, and the new, mid-1980s version of The Twilight Zone that featured episodes he'd written, and they also left a better impression than The Starlost. There were also interview clips of him on Prisoners of Gravity. And, of course, there was the rerun of his brilliantly heart-wrenching Star Trek episode, "The City on the Edge of Forever" (which also ignited his anger, because of its rewrites). I can't say that all of this resulted in me becoming the biggest Ellison fan in history, but I did develop a taste for his writing and started keeping an eye out for it in the bookstore. Where this really paid-off was in the mid-1990s when White Wolf Borealis released the Edgeworks series of books collecting decades worth of his stories, essays, newspaper columns, and other writings. This was a chance to dive deep into his writing, and going through that water column and down into that seabed, explore Ellison's mind — or, at least the portion of it or version of it that he wanted people to see. Some of the stories were amazing, others were entirely forgettable. But even in the mediocre tales, there was always the chance to see how well Ellison could craft his imagery. How could you possibly forget his comparison of a musician's playing and stage presence to a spider's kiss? But as important as the fiction was the avalanche of essays, columns and reminiscences. This was no-holds-barred, pry-open-your-ears-and-jam-his-opinions-in-them-until-your-head-explodes social commentary and literary and film/TV criticism. I didn't necessarily agree with all of his opinions, or with the way he dealt with people when his ire was (all too frequently) raised, but, damn, it made for absorbing and entertaining reading. The 90s was also the age of Babylon 5, which listed Ellison as a creative consultant. I don't know to what degree he influenced the series' mastermind and chief writer J Michael Straczynski as the show unfolded, but he deserves thanks for whatever part he played. That show made television, and science fiction as a whole, better. Getting back to Ellison as a person though... I never had a chance to meet with him. The closest I came was at the Vancouver debut of the documentary about him, Dreams with Sharp Teeth, in 2008 when he phoned between screenings and took questions from the audience. The audience end of the conversation was dominated by old guys from the local sf community, but that was okay; I was content to just sit back and listen, and Ellison was pleasant enough and recounted some interesting stories. Since the announcement of his death, the online sf community has had a lot to say about what he was like. Some remember him as a friend, supporter of other creators, and a staunch defender of writers' rights. I've always loved his impassioned speech in the afore-mentioned Dreams with Sharp Teeth about the despicable behaviour of companies that try to take advantage of writers. While Ellison was specifically talking about how studios try to screw fiction/screen writers, the sentiment applies to how other organizations prey upon non-fiction writers who create communications and marketing materials, especially freelance writers. Working in this field myself, I can't tell you how often I've encountered managers and others in various big orgs that undervalue writers (misguidedly believing "hey, anybody can write, so writers don't deserve much compensation or respect"), and try to pay next to nothing for our efforts. Ellison's charge that these managers would never accept low wages for themselves, and therefore should not expect writers to accept this kind of shafting, and, more importantly, that writers should not allow themselves to be treated this way, has been my mantra for years. And yet, there are also many who highlight his faults, including his ego, temper, treatment of those he decided to look down upon (and here, recalling Ellison's own accounts of dealing with fans sometimes, it's always seemed to me that despite is avowed hatred of bullies, he was something of one himself), and his groping of Connie Willis at the 2006 Hugos. These are serious problems, and anyone who admires his work has to sit back and consider their implications for one's overall opinion of Ellison. Not having known him personally, never having experienced either his friendship and support or his disdain and abuse, and his self-perceived intentions behind them, I don't know how much weight to give either side. Ultimately, as Cory Doctorow points out so eloquently in his obituary for Ellison on Boing Boing, this makes the old curmudgeon human: "... two things can be true: that someone did something bad, and that someone did something good." And so, for those of us who didn't know Harlan Ellison, it's important that we remember both: the good stories and the cautionary tale of bad behaviour. Recently, I was looking at the to-review pile piling-up on my bookshelf and I thought This is nuts! Why am I letting these things go and only putting out one or two review posts a year, consisting of a dozen books? Not only does it take a long time to write — and read! — those fat compilations, but I've got a move coming up in the next couple of months, and it'll be easy to lose track of which books have been reviewed and which haven't. So I've decided to do something I should have done a few years ago: cut these review lists down. From now on, I think I'll only do three at a time. That's easily digestible and won't take hours to write (and it makes it easier to remember story elements if I'm not trying to recall something from a better part of a year ago!). As always, consider yourself warned: Here there be spoilers. Imagine a world mostly run by the forces of darkness. Where, sometime in the early 80s, a cabal of vampires, were-creatures, demons and other monsters came out from under the existential bed and offered the chance for anyone with enough money to become one of them (which is entirely metaphorically appropriate, given that the 1980s were the height of predatory financiers trying to seduce the public with shady investment opportunities). It was an offer that attracted most of the rich and celebrities, and pretty much every politician — all of whom used their political, social and economic clout to pass laws legitimizing and protecting (with some restrictions) their predatory behaviour and grip on power, and normal people were left to keep trying to make a living as best they could in a world that's otherwise mostly the same as ours. Think if William Gibson had written Vampire Hunter D. But then, not too many years after, superheroes began to appear, fighting the forces of darkness — and sometimes each other. 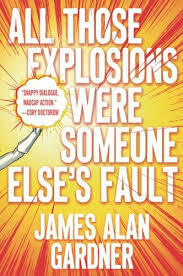 That's the set-up for James Alan Gardner's rollicking, funny novel All Those Explosions Were Someone Else's Fault, where University of Waterloo student Kim Lam and her roommates stumble into a lab accident and gain super powers. As they try to get a handle on their new abilities and come to terms with their new identities — and find the right costumes — they have to defend themselves against attacks by spoiled rich kid monsters who appear to be part of some kind of conspiracy. But as the team digs deeper into the mystery, they have to figure out where the real threat (to themselves, the city of Waterloo, and the world) is coming from: the forces of darkness, or another person with superpowers. You're not supposed to judge a book by its cover (or, by extension, its title), but I would have picked up ATEWSEF just for the title alone. How could you not?! But I'd also heard good things about it prior to its public release when I interviewed Spider Robinson back in 2016, and (especially because of the title) I made a mental note to keep an eye out for it. While the book is a fast read, it's a solid, self-contained story with well-rounded, believable characters, and it left me wanting more of Gardner's 'Explosions universe. The only thing I didn't like about it was the protagonist talking trash about the St Jacob's Farmers' Market. I spent the first half of my childhood just down the road in Cambridge and went to the St Jacob's market on many weekends. In fact, my ex-wife (who's from Hong Kong, loves markets, and thinks St Jacob's is a piece of heaven) and I made it a priority to hit the market every time we went back east to visit friends and my family over the last two decades. Having been to markets large and small across the country and around the world, I still count St Jacob's as the best. While I agree with Gardner on the principal of "to each his/her own", when the St Jacob's market is destroyed in the book in a monster fight/evil genius device explosion, I almost shed a tear, and when the character Kim/Zircon complains about the place earlier in the story, it was enough that if I was living in the 'Explosions universe, I would have wanted to become a super villain just to wage an epic battle with her over the slight. That said, you need to run out to the bookstore at super speed and grab a copy of All Those Explosions Were Someone Else's Fault as soon as you can. Kim Stanley Robinson goes bobbing for the Big Apple in his newest novel, New York 2140, which is set in a near future where climate change has flooded the world's coasts — twice! — leaving NYC and other cities having to adapt to life as new versions of Venice. The story centres around the challenges faced by the residents of Madison Square's Met Life tower — the office building now having been converted into a housing co-op, with a couple of upper floors converted for farming and livestock, and the ground, er, water level used as a boathouse. A couple of software designers camping in the gardens go missing. Two homeless boys get into a series of misadventures (though profitable ones) and need help. There's a treasure hunt. There's a push by unseen forces to get the residents to sell the building. There's a challenge to find a new community-friendly model for financial investment. Many of the residents have to re-invent their lives. And there's one hell of a storm a-comin' that threatens them all. I think to love New York 2140, you have to love New York. And I don't. I don't have anything against NYC. I just don't care. Never been there, and it's not anywhere near the top of my list of places to see. Who knows, maybe if I do go there someday, I'll change my tune and become a true believer, but I doubt it. Nothing that I've ever seen in the news, or documentaries, or pop culture, and nothing I've ever heard from friends and family who've been there has made me desperate to see it. And the book is such a hymn to the Big Apple, grabbing literary, scientific, historical, and cultural sources to sing parts in the choir backing up the overall story, that a reader who lacks that evangelical ardour for the city is always going to be left standing outside of the church door of Robinson's composition, admiring its architecture, art, and melodies, but unable to truly connect with its soul. 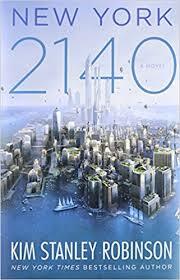 That said, New York 2140 is a good book. The plot kept me wanting to turn the pages, the worldbuilding is detailed and believable and (presumably) seamlessly fuses the look and feel of the city that people know now with its soggy counterpart in Robinson's future, and the characters are three-dimensional people who you would expect to meet on any given day in any city, but probably especially in New York. Among them, I was especially struck by the narrator, or "the citizen" as this person is called in his/her excerpts that punctuate the spaces between chapters. To pick up the metaphor above, the citizen is like a preacher, reverently in awe of his city-god and calling everyone to prayer from the pulpit, while also shaking his head at its occasional Old Testament hardness. As much as these interludes are sermons, they're also worldbuilding sessions, bibliographies, infodumps, and resigned doomsday pronouncements, in tones that alternate between the university intellectual and the wiseass on the street. I kept picturing the voice as Robert De Niro's as he sifts through the wreckage of fires in Backdraft (yeah, I know, Backdraft was set in Chicago, but De Niro never shakes his status as the embodiment of New York). Something else interesting about the characters was the gender roles. The women of New York's future are (with only two exceptions that I can recall — one of whom is a non-entity only referenced in passing) the leaders. They're the organizers, strategizers, motivators, and inspirers who rally everyone around them, identify what needs to be done, and make sure it gets done. Charlotte is the head of the building's strata council, a lawyer and community organizer, and has the ear of a senior federal official. Gen is a police inspector who seems to get more done than the chief. Amelia, the environmentalist/reality show host, may seem like more of an anime heroine than a serious character, but even she has a leadership role, with a huge internet presence that helps to shape global pop culture opinion. There's Idelba the dredging company owner. The mayor of New York, a crime boss, and the US president are also women. Meanwhile, the men of Robinson's novel, for the most part, are the foot soldiers, wizards and poets — the ones who take orders, run around, and do the work; and the possessors of the esoteric knowledge (whether financial, historical or engineering) needed to accomplish it, or the poets and thinkers cited by the citizen who have celebrated and studied the city in its past. My only complaints about the novel are of the nitpicking variety. At one point, the citizen proclaims that "finance is not a lifelong vocation". Perhaps things are different in the US (or the climate-change-ravaged future America that Robinson portrays), but I've known a lot of people in finance in Canada who have stayed in the business for the long haul. Then there's Gen's failed police raid on a financial office, where she and her cops show up with the proper paperwork, but are turned away by armed private security guards. Again, maybe things are different legally south of the 49th or in Robinson's future, but up here, if someone interferes with a sanctioned police operation, they get arrested, and if the police are outnumbered, they get backup and arrest everyone. It's these sorts of little things that can pull a reader out of a story. However, these are ultimately trivial details, and the story itself is solid and entertaining (sometimes even funny). All in all, even if you're like me and indifferent to the Big Apple, it's worth heading to the bookstore to take a bite out of New York 2140. So an octopus-centaur-inspired, aging cyborg travels back in time and faces-off against a Sumerian warrior king. That's not what Kelly Robson's Gods, Monsters, and the Lucky Peach is about, but the novel does involve those elements. And together they make one hell of a hook. The story centres around Minh, an environmental survey expert whose lower body is a clutch of six cybernetic prosthetic tentacles, who lives in a post-environmental-and-industrial-collapse Calgary. It's a world that's been ground down into a sullen barrenness so severe that you almost get the impression the author is looking at Gibson's portrayal of human habitat degradation and saying "Oh yeah? Watch this." While she's had a long and respectable career behind her, Minh's current prospects at landing a contract that will help her pay to keep her modest apartment with its view of the mountains are looking dim — until she gets a line on an assignment mapping ecologies around the Tigris and Euphrates rivers for a mysterious corporation. A corporation that's invented time travel. With the help of a young assistant who's eager to prove herself, and an old friend with a passion for horses, Minh puts together her bid for the project, lands it, and sets off to 2024 BCE to get the job done. Except her team's arrival exacerbates political strife among the locals, prompting the king and his men to go on the hunt for the supposedly demonic interlopers, whose technological advantages may not be enough to help them survive, let alone get back to the future. It's a short novel that moves along at a no-nonsense pace so efficiently brisk that it matches perfectly with the "I don't have time for this crap" personality of its protagonist. The fact that the main action of the plot — the attempt to land an environmental survey contract — is so delightfully banal is a master stroke on the author's part. It makes the fairly alien world of the future that Robson presents more recognizable to the reader — these people are working, and going through the motions, much as we do now, and because of that, despite their physical and cultural differences, we're able to empathize with them as human beings. There are a couple of backstory/worldbuilding elements in the book that I especially enjoyed. The first is the description of humanity's retreat underground in the face of environmental collapse. It feels a lot like a nod to Space Battleship Yamato/Starblazers, though in this case, rather than an alien attack, humanity has only itself to blame. The second, and more significant and socially interesting element, is the relationship between the two generations: the older cohort, known as "the plague babies", of which Minh is a member, and the younger group (the plague babies' children — of sorts), known as "the fat babies". At one point, Minh's assistant, Kiki, a fat baby, complains that the plague babies have created a world for themselves and now exist just to service the economy, leaving no opportunities for the fat babies, and giving no thought to them. It's a brilliant, scalpel-sharp metaphor for Generation X's rightful indictment of the Baby Boomers, who built upon the world left to them by the War Generation, made comfortable lives for themselves, then, thinking only of their own enrichment, partly by deliberate design and partly by accident changed the economic and industrial game entirely and refused to leave the workforce, thereby shutting out most of their children from opportunities to advance. Who would have thought a book about a time-travelling octopus-centaur-inspired cyborg environmental surveyor would be the voice of an entire disaffected generation? Then again, what could be more appropriate to the world we live in than a work of science fiction providing this comment? Something else that comes to mind when reading 'Lucky Peach: I think there needs to be a new sub-genre of speculative fiction used to classify stories where the primary action of the plot concerns common procedures in business or government policy. Oh, sure, there may be weird science fictional or fantastic elements, settings, or societies included as window dressing, but the stories themselves centre around entirely normal, day-to-day affairs that most of us do, or are at least familiar with; the kind of activities that usually come with an emotional involvement ranging between boredom and professional interest. Which is not to say that the stories themselves are boring or pedestrian, rather, they are banal only in the in-world motivations for their plots, and it's a hallmark of their writers' excellence that they can take this kind of subject matter and find the underlying truths, emotional significance, universality, and, yes, even excitement in the telling of the experiences of characters going through them. There aren't a lot of these tales, but they do have a long and venerable history in the genre, starting at least as far back as 1959 with Chandler Davis' tragicomic short story "Adrift on the Policy Level", which follows a scientist on a Dante-esque odyssey through the depths of a corporate bureaucracy on a search to get a new crop-saving chemical accepted for widespread use. More recently, there was Katherine Addison's 2014 novel The Goblin Emperor, which, when its trappings of throne room intrigue and courtly manners are peeled away, is simply a tale about getting government approval to build a bridge. So they're certainly entitled to be grouped into their own "punk" status. After all, if cyberpunk, steampunk, dieselpunk, ecopunk and assorted other speculative fiction subsets deserve the label, why not this niche? So how about banalpunk? Nah. Some might think that carries a slightly negative connotation. Approvalpunk? Sounds oxymoronic. Proceduralpunk? Maybe, though it sounds vaguely primetime-cop-drama-ish. Projectpunk? A possibility as well, though it lacks a certain panache. What do you think, fellow members of the nerdiverse? What should we call this sub-genre? 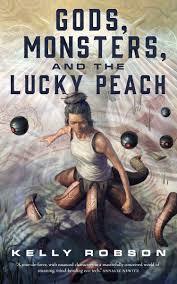 Whatever label we slap on this kind of story, Robson's Gods, Monsters, and the Luck Peach is certainly an excellent addition to this distinct sub-genre — and science fiction in general — providing a cracking good — and intelligent and meaningful — read. Some may find what I'm about to say shocking and disturbing given that I'm a life-long Star Wars fan. But, as much as I hate to say it, Solo: A Star Wars Story was lame. Not terrible. I'm not saying this instalment was The Star Wars Holiday Special bad. But, like the Millennium Falcon's hyperdrive grinding to a halt outside the asteroid field when Han, Leia and the gang were trying to escape from Hoth in Episode V, 'Solo certainly failed to live up to its potential. Admittedly, I wasn't that psyched about the film to begin with. I didn't pay much attention to the hype in the months leading up to its release, was indifferent to the teasers and trailers, and didn't put it at the top of my must-watch-for-the-summer-popcorn-movie-season list. In fact, I went to it on opening night more because I knew the little mom-and-pop theatre down the road wouldn't be crowded than out of service to a lifetime of devotion to the saga. That's because (and again, there may be some members of the fan police out there that might want to tear up my nerd community membership) I think I've hit Star Wars overload. Yes, insert gasp of horror. Remember when the release of a new Star Wars movie was an event? Remember standing for an hour or more in a line that stretched around the block — even when it wasn't opening night? Remember how Star Wars movies used to only come around every couple of years? Sure, in the late 70s and early 80s, the franchise saturated pop culture with a toy line so extensive that the action figures alone outnumbered the stars in the sky. And yeah, there was the aforementioned 70s variety show-style nightmare of the 'Holiday Special, and the sickeningly cute The Ewoks: Caravan of Courage and The Ewoks: The Battle for Endor, and The Ewoks and Droids Saturday morning cartoons (though Droids had some good moments). Not to mention Marvel's Star Wars comic series, and a handful of media tie-in novels (including Splinter in the Mind's Eye and the Lando Calrissian books). But the movies themselves somehow stood apart. Despite their faults, they were special, and everyone seemed to know it, and they were something to look forward to. They had the feel of being hand-crafted — that there was care that went into the making of them. That feeling even managed to persist in the late 90s when the original trilogy was rereleased, accompanied by a rapidly growing and increasingly complex Expanded Universe of tie-in novels and (courtesy of Dark Horse Comics) comic series (all of which were promptly rebranded as the "Legends" and erased from the series timeline and relevance when Disney took over), video games and toys. Even the much-debated (and by some — not me — reviled) prequel trilogy instalments were events that were anticipated and had the feeling that genuine care was put into their creation. But not anymore. Now, Disney — in its quest to cash-in on the franchise as much and as often as possible — is cranking Star Wars movies out so frequently, and with an increasing lack of care for quality, that they feel like they've been churned-out by a fully automated factory. Never mind the current lines of toys and comics (some of which, like Marvel's Darth Vader series, are exceptionally good) and video games, there's the Clone Wars animated TV series that's been running for a decade, and the new raft of movies that have been stampeding into theatres with mechanical regularity for the past few years. The Force Awakens was followed a year later by Rogue One, with The Last Jedi a year after that, and, now, 'Solo less than six months later! And, aside from Episode IX, there are other expanded universe movies in development. Whether you're a dedicated speculative fiction fan or just a normal consumer of pop culture, you can't turn around without stumbling over yet another Disney attempt to separate you from your money under the banner of Star Wars (or its other cash cow, the Marvel movie franchise). Didn't like the last one? Don't worry! They'll serve up another instalment with a different flavour in six months to a year. Loved it? Great! They'll have your next fix ready to mainline in a flash! You can't even catch your breath these days for all the Star Wars coming at you — if not actual movies in the theatres, then TV series or a non-stop barrage of teasers and hype on the 'net. The old cliche is that familiarity breeds contempt. I wouldn't go quite that far with the venerable space saga, but in this case, I think it means that Disney has oversaturated us with Star Wars to the point where the inevitable loss of quality can lead to burnout and indifference. Overall, Solo: A Star Wars Story is choppy and predictable. Just as bad, it suffers from a lead actor who neither physically resembles Harrison Ford, nor is able to adequately portray the personality of Han. Instead, Alden Ehrenreich looks more like Stephen Billington playing the prince's friend/lover/advisor Phillip in Braveheart (I kept waiting for Patrick McGoohan to appear and chuck him out a window), and comes off as vaguely like a young Christian Slater — if Slater was overly self-aware and trying too hard to play the Solo part as cute rather than his usual edgy delivery or as the worldly, cynical, sarcastic smuggler that we know from the rest of the series. And yes, I know, this is supposed to be a young Han Solo, but given the character's life experiences to date, I'd expect to see more of the Solo we know from the other movies in this performance, rather than what Ehrenreich and director Ron Howard and the Kasdans offer us, which is a personality who feels like he's been lifted from a teen-oriented vampire drama — a weakly-delivered wannabe who the audience just can't take seriously. And really, if it's more Han Solo that we, as fans, want, then there's no need for this movie at all: we've already been given Malcolm Reynolds in the 2002 TV series Firefly and its cinematic sequel, Serenity. Between Joss Whedon's writing and Nathan Fillion's performance, the portrayal of Mal was close enough to Han (if not exactly the same) to create the same presence and do the job for this type of story damn near perfectly. Even Firefly's train robbery episode was better than 'Solo. The film also falls all over itself trying to reference as much as possible of the titular character's canon-referenced backstory, like winning the 'Falcon from Lando in a Sabaac game, or making the Kessel Run in less than 12 parsecs, or freeing Chewie from slavery. It also jams in allusions to all other corners of both the active franchise and its old, cast-off properties, from the name of the swamp planet (which came from Splinter in the Mind's Eye), to Darth Maul being alive and well — if prosthetically enhanced (a resurrection courtesy of The Clone Wars TV series), to the roster of galactic ne'er-do-well names casually mentioned (which, and correct me if I'm wrong, I'm pretty sure included the Tonnika sisters from the cantina in A New Hope). The fan servicing was so over the top that if felt like hand-waving on the part of the director and writers to distract the audience from the shortcomings of the story. On the positive side, the visuals are stunning (which we'd expect from a Star Wars film), and most of the secondary characters and their actors' performances are pretty interesting (with the exclusion of Rio Durant — John Favreau does a capable job with the four-armed, hairless chimp, but ultimately this character's just a slightly less acidic version of Rocket Raccoon). 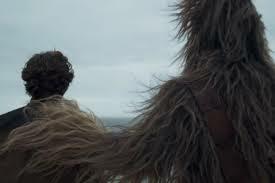 In fact, I think the film could have been a lot better if more screen time had been devoted to further developing the stories of Chewie, Lando, L3-37, or the others. Donald Glover especially is to be commended for doing a wonderful job of stepping into the role of Lando Calrissian. That said, at times he pushes the character hard against the border of campiness — something that isn't helped by the closet scene aboard the 'Falcon, which makes him come off less like Billy Dee Williams' Lando, and more like Cat from Red Dwarf (seriously, watch that scene again and try not to think of Glover in canine fang caps singing "I'm gonna get you, little fishy!"). Val and Beckett were also great characters — I could have watched a whole movie about them, rather than what was created for Solo. I just wish that instead of the constant avalanche of Star Wars and Marvel movies, Disney would use its considerable money and talent to offer us a little more variety in its live-action fare. I'd love if The Mouse could give us the third part in the Tron series, or the reboot of The Black Hole (both of which were planned but then shelved when Marvel and Star Wars were acquired), or another John Carter flick, or something totally new. Right now, Disney's going for the safe bet of its biggest properties, and maybe because they're trying to generate so much so quickly, they've finally started to spiral into the singularity of mediocrity. It all smacks of Yogurt's line in Spaceballs: "God willing, we'll all meet again in Spaceballs 2: The Search for More Money".